Clinton Merrick Hurdle was born on July 30, 1957 in Big Rapids, Michigan. His father worked for NASA during the space age race to get a man on the moon. The Hurdle family moved to Merritt Island, Florida when Clint was a boy. The six foot three left hand hitting Hurdle was an outstanding athlete, getting drafted in the first round (the 9th pick overall) by the Kansas City Royals in 1975. He was a promising young outfielder, making his MLB debut at just twenty years old. He made the cover of Sports Illustrated getting labeled “This years phenom” during Spring Training 1978. It was later looked backed at that those words this jinxed his career. He joined an already powerful Royals team that won three straight A.L. West titles (1976-1978) Hurdle debuted as a September'77 call up, hitting an impressive .308 in nine games. In 1978 he was a utility player getting into 133 games in the outfield & at first base. 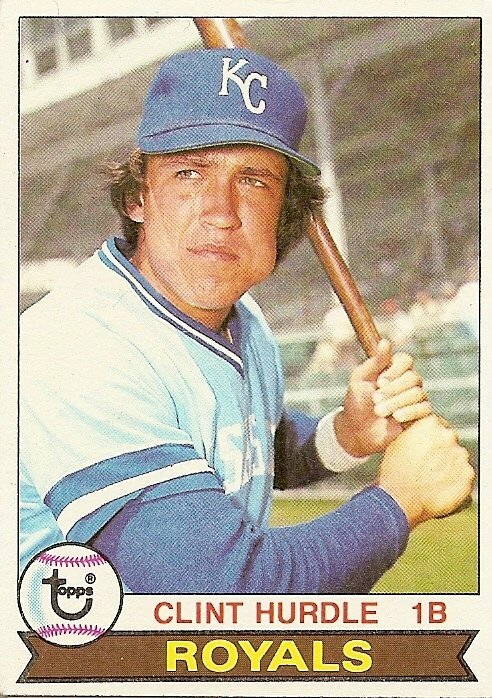 He hit .264 with seven HRs & 56 RBIs as the Royals won another Western title. In The ALCS he played in four games going 3-8 (.375) with an RBI. The next season he struggled, batting .240 by the end of May, not living up to all the hype. He was sent back down to fine tune in the minors hitting just .236. His 1979 Topps baseball card had him holding a bat on his shoulder with a cheek full of tobacco, looking like a classic old time ballplayer. He returned to finish out the year with K.C. 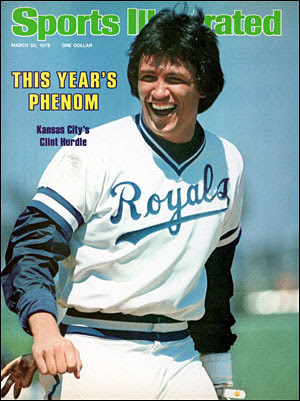 In the Royals 1980 World Championship season, he had his best season. He was the clubs main right fielder, batting .284 with 10 HRs, 31 doubles & 60 RBIs, mostly hitting seventh behind Amos Otis. In the outfield he had eight assists. Post Season: In the 1980 ALCS he only got two at bats going 0-2 . In the World Series against the Philadelphia Phillies, he played in four games, hitting safely in each one. He batted .417, scoring a run & even stole a base. Hurdle only had one other stolen base in his entire career. 1981 began well, but back injuries set him back & eventually ruined his career. He finished the strike shortened 1981 season batting .329 in only 28 games played. In 1982 he was traded to the Cincinnati Reds for pitcher Scott Brown. Hurdle hit just .206 and was released. 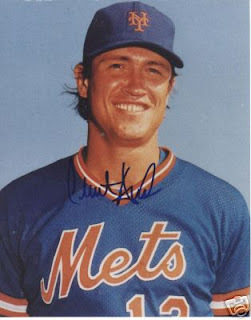 The New York Mets gave him a chance in 1983 & he reported to AAA Tidewater. In Tidewater he found new life, still only 26 years old, he hit 22 HRs driving in 105 runs & batting .285. He got a September call up to the Mets debuting as a pinch hitter on September 12th. In 13 games he went (6-33) hitting just .182, playing nine games at third base. 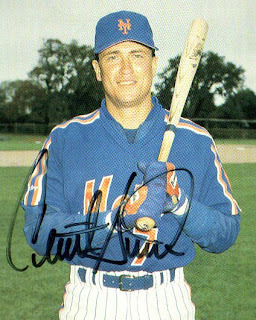 He spent all of 1984 back at AAA Tidewater, hitting 21 HRs as the Mets coaches continued to transform him into a full time catcher. 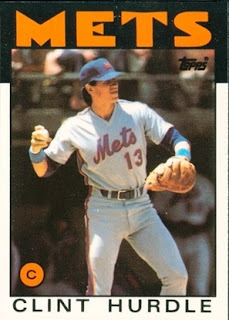 He progressed well & earned a shot on the 1985 Mets squad as the team's third string catcher. On April 28th, he was a Mets hero even though it came due to an opposing players error. In the bottom of the 18th inning of a five hour & twenty minute game, he hit a ground ball to first base. The ball was misplayed by the Pittsburgh Pirates Jason Thompson, allowing Mookie Wilson to score the game winning run. On June 9th he hit a two run HR against the St. Louis Cards in an 8-2 Mets loss. He hit two more HRs on the season driving in a total of seven runs in 82 at bats, appearing in 43 games (17 games at catcher) batting only .187. He was drafted away (Rule 5) by the St. Louis Cards in December 1985. In 1986 he played 78 games, backing up Jack Clark at first base. He hit just .195 & was released. In 1987 he once again signed with the Mets as a free agent. In 1987 he made two pinch hit appearances and filled in at first base for one game in New York. On June 17th he got his last career hit before ending his playing days. In a ten year playing career, Hurdle hit .259 with 360 hits 32 HRs 81 doubles 193 RBIs & a .341 on base % in 515 games played. He played 329 games in the outfield with a .965 fielding % & 19 assists. He played 92 games at first base & 22 games at catcher. Retirement: Hurdle played 1989 in the short lived senior professional league in Florida. 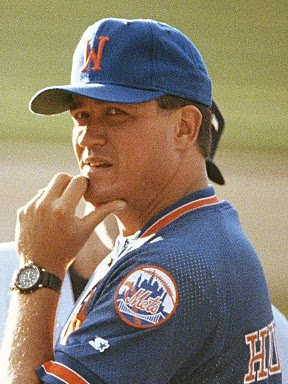 He returned to the Mets organization becoming manager of the St. Lucie Mets in 1988. There he won the league Championship finishing up in first place three times. Next, he served as Manager for the AA Jackson Mets (1990–1991) getting to the playoffs two more times. He then went to manage the AAA Tidewater Tides in their last season at Tidewater in 1992. In 1993 he was at the helm in the team's first season at Norfolk. In 1994 he joined the Colorado Rockies organization and became the big league club's hitting coach by 1997. Five seasons later in 2002 he took over as the Rockies manager replacing Buddy Bell. The Rockies had five straight losing seasons under Hurdle, finishing fourth four times. In 2007, the season looked like another losing one for the Rockies early on. Then the team went on a tremendous hot streak in the final month of September, finishing up winning 19 of their last 20 games. 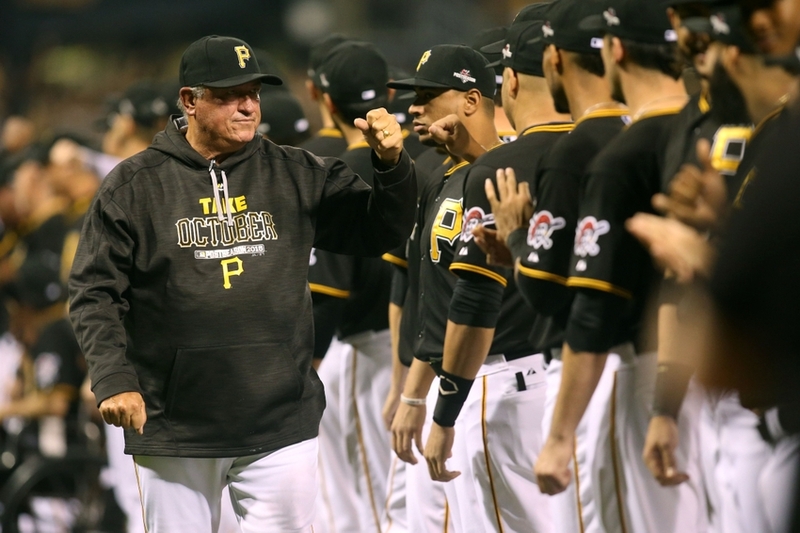 The last team to win 19 out of 20 games was Clint Hurdle’s 1977 Royals. The Rockies tied the San Diego Padres for first place on the last day of the regular season, forcing a one game playoff. They won the game in dramatic fashion; in the 13th inning advancing to the team s first post season in the franchise history. Post Season: Hurdle’s Rockies remained hot, sweeping the Philadelphia Phillies in the NLDS. They then beat the Arizona Diamondbacks in four straight games in the NLCS advancing the their first World Series. It was here the team finally ran out of gas, as they were swept by a mighty Boston Red Sox team, four straight. After all the celebrations in Colorado & honors for the surprising team effort, it was back to work in 2008. The Rockies would finish third & then after starting out 18-28 in 2009, Hurdle was fired as manager. His career record in Colorado was 534-625 (.461%). 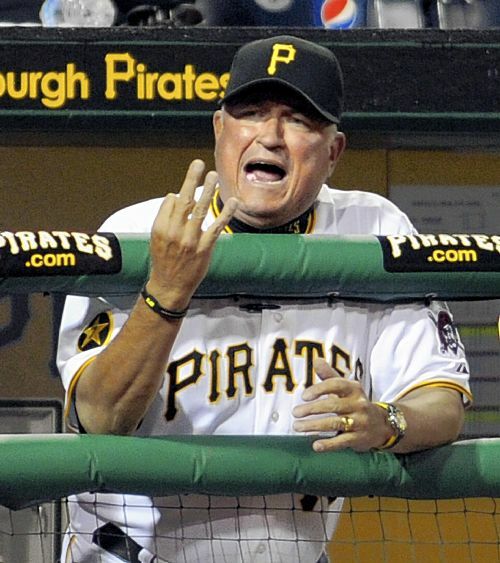 In 2011 he took over as manager of the Pittsburgh Pirates. hurdle finished fourth two straight seasons & impressed everyone winning 79 games (79-83) in 2012. 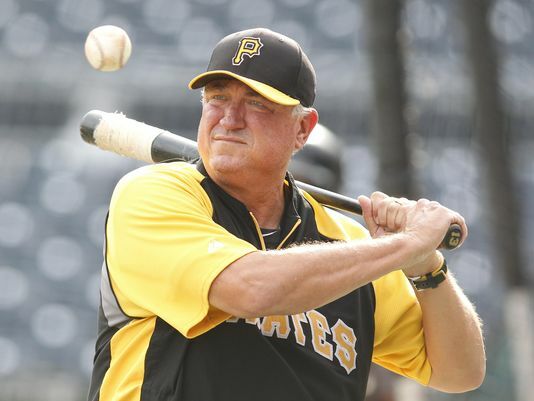 In 2013 his Pirates won 94 games (94-68) winning an NL Wild Card spot. It was the best seasonal record Hurdle posted in his managerial career. That season Hurdle won the National League Sporting News Manager of the Year Award. The team finished second behind the St. Louis Cardinals, but won five of their last six games, three straight over the Cincinnati Reds to earn a wild card spot. They would face the Reds in the NL Wild Card Game. The Pirates brought baseball life back into the City of Steel, as Pittsburgh had become a football town almost forgetting the lowly Pirates of the past. Hurdle's club was led by the NL MVP; Andrew McCutchen, one of the games most popular players. The Pirates beat the Cincinnati Reds in the NL Wild Card game, but lots an exciting five game series to the St. Louis Cardinals in the NL Division series. In 2014 the Bucs returned to the post season going 88-74, even tough they had lost the final two games of their regular season. They lost to the eventual World Champion San Francisco Giants in the NL Wild Card Game. In 2015 Hurdle's team won the most games in a single season of any team in his entire managerial career (98). In a tough division it was only good enough for a second place wild card spot. The Pirates lost to the Chicago Cubs in the NL Wild Card game. In 2016 he returned for his seventh season as Pirate manager. 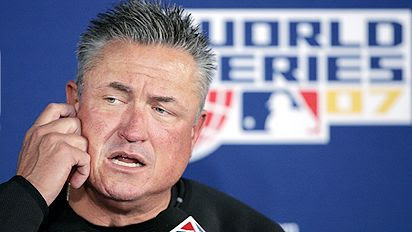 Thru June 10th in his managerial career he is 534-625 with a .461 win %.